In January 2015 we were all strangers that moved to Orlando, FL as a part of the Disney College Program at Walt Disney World. Unlike most, the five of us roommates quickly clicked. 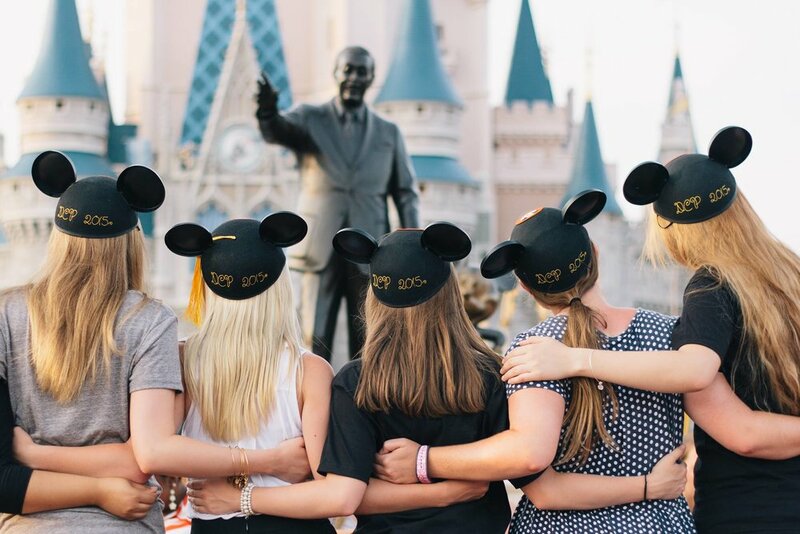 We discovered that there is a magic that gets under your skin when you work for The Mouse, and through that we all became close, and even bigger Disney fans. So here we are, still friends, who've become as close as sisters. And spoiler alert! We're still the biggest of Disney fans! The formation of Sisters & Disney came about as Erica and Jaycee were discussing plans for an upcoming Disneyland trip that they were taking and realized that between all the gals, visits to Disney Parks happen often! Erica had been thinking about starting her own Disney-themed blog for a year or so, but never felt the timing was right. This seemed like the opportune moment. And not with one, but with all the sisters! We are hoping that this adventure will help us, not only remember the unique times we are blessed with, but also help and inspire you find magic in everything you do! How can I contact you? Do you collaborate? If you are emailing with a particular question in mind, please check the FAQs below first. Your emails mean so much to us, and we appreciate you taking the time to write! For specific questions, collaborations or sponsor inquiries feel free to fill out our contact form. Where do you live? Do you live near each other? We all live in the Western United States! As twenty-somethings, we're all in different phases of life, so we're hardly ever permanently living somewhere. Currently, we're located in Arizona, Utah and Idaho. We all live fairly close to each other in order to visit often! But that's never enough. So we are big believers in FaceTime, Marco Polo, and texts. Some of us are working professionally, and some are in school. Erica works as an Art Director for a world-wide health company. Jaycee is the Director of Communications for a growing dental company. Katelyn is an office administrator at a local surgery center and attending BYU-Idaho, pursuing a degree in Agronomy, Crop, and Soil Sciences. Kat is currently working as a high school American History teacher, and is married to her prince charming, Cameron. Taylor is a full time student at BYU-Idaho, majoring in Child Development. We're grateful for the ability to come together to share our love for Disney with anyone who wants to hop on the carpet ride! We are so thankful for the chance to do it and for the excitement that it brings into our sisterhood. The majority of the photos we use are taken by either Erica or Jaycee. Erica uses a Canon 5D Mark II paired with a 50mm lens. Jaycee uses a Canon Rebel T6 paired with an 18-55mm or 50mm lens. Occasionally the rest of the sisters will use a Canon Rebel t3i. Erica edits all our photos with Adobe Lightroom and Photoshop. We all also use our iPhones a lot for many Instagram posts and stories and edit those photos with apps like Lightroom Mobile, ColorStory or Afterlight. In addition to our photos, Erica shoots our featured videos with the Canon 5D Mark II. She edits all of our videos using Adore Premiere Pro. All other media not owned by Sisters & Disney is credited to the rightful owner. You can find the answers to all the questions we've thought to write about planning, traveling, what to expect, weather, etc. for your Disney trip(s) in our Planning & Traveling section. If you still have a question that we can help you with to make your Disney trip the ultimate trip, email us at 5SistersFromDisney@gmail.com. We decided to change our name as Sisters From Disney to Sisters & Disney for several reasons. For a while we knew that a change was for the best with the name, as Sisters From Disney is a bit of a mouthful. We found that many followers and readers couldn’t remember the name. We brainstormed and collaborated to find a name that felt more catchy, yet still represented us. We believe that Sisters & Disney keeps the unique aspect that we five have become like sisters, through a love of Disney. And we didn’t want that story to leave our brand. We feel that it represents that first, we are sisters, best friends no matter what, and then comes our mutual love for Disney.